I have a fantastic product review for you today! The Gold-plated stainless steel case and bracelet has fixed gold-plated bezel set with crystals. Champagne quilted dial set with Swarovsk crystals with gold-tone hands. No markers. 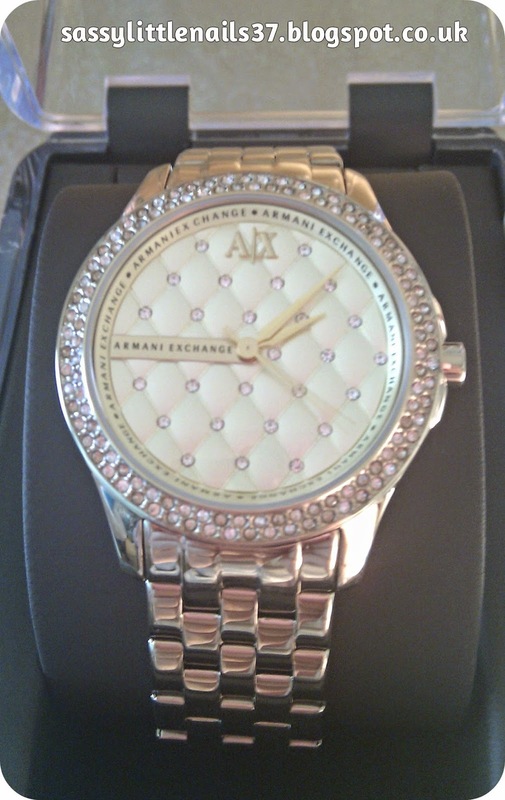 The Armani AX Exchange logo appears at the 12 o'clock position.The metallic-tone IP (Ion Plated) stainless steel bracelet fastens with a deployment clasp. I absolutely love this watch!! when I first seen the watch online I knew it would look just as stunning if not even more so worn on the wrist. I was very impressed with the packaging it arrived very safe and in a sturdy box. Covered in plastic to protect the steel and the watch face.I removed these straight away to try the watch on! To my surprise I thought I would have needed the strap adjusting but when I opened the clasp and slipped it on to my wrist it fitted me perfectly! I love the Gold tone as I have a Guess watch in Silver tone and I don't have a gold tone watch so this is a real treat for me and something I have wanted for a while. The watch is very classy and elegant featuring a matte quilted dial with 26 clear stones detailing each cross over. 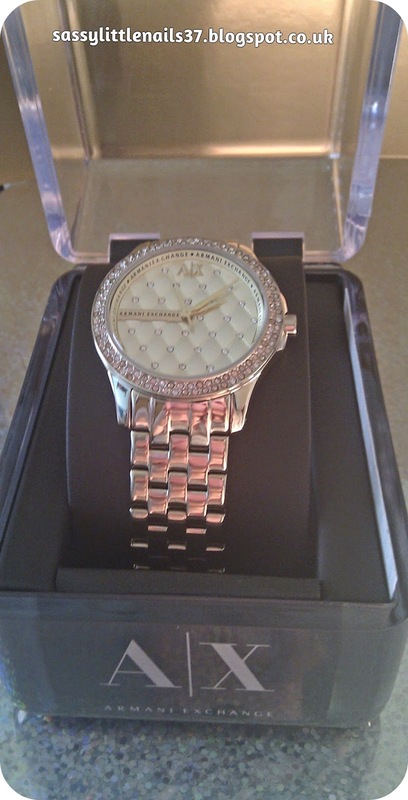 The crystals also circle around the face giving this beautiful stylish watch some bling which I love! The watch feels very comfortable on the wrist and not to heavy which is a plus for me as I find my Guess watch can get heavy during the day. I also like the fact the watch is water resistance to 50m as this is piece of mind if you get water splashed on the watch if washing dishes! I personally would not wear the watch for swimming however it would be safe to do so at 50m or less. When the watch gets a little dirty I simply give it a wipe with a soft damp cloth and dry carefully. 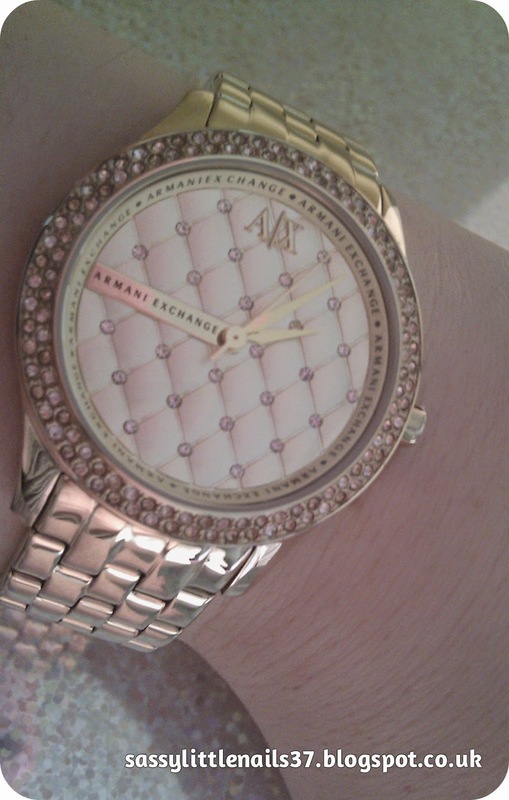 I fell in love with this watch and the look of the Swarovsk crystals details. 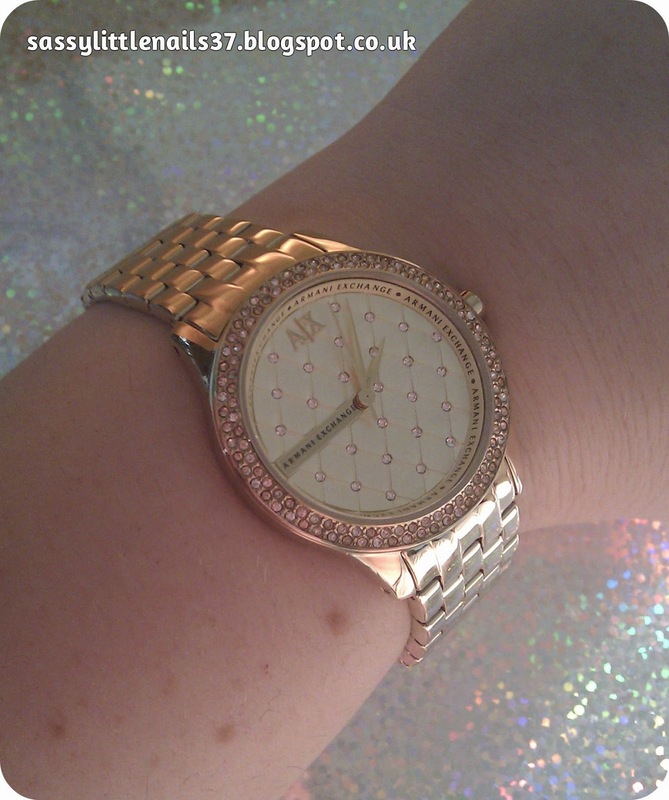 And for accessories that need to be super versatile - you can't go wrong with a Gold tone watch! 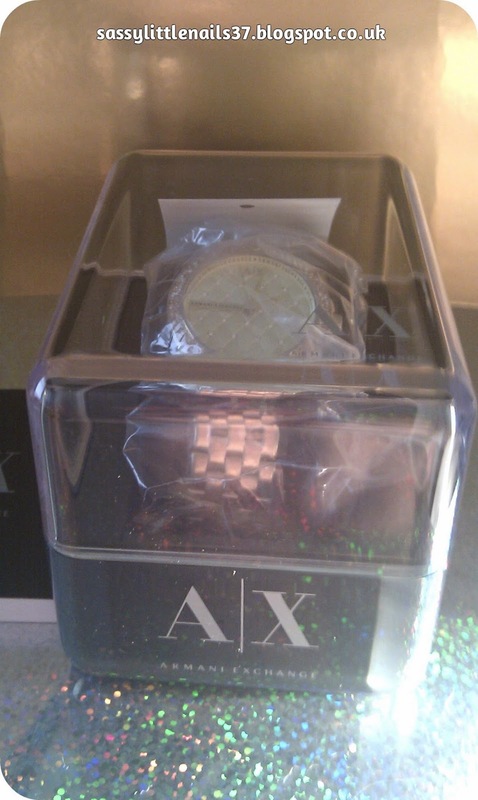 Gold practically goes with a lot of thingsand for style well you can't go wrong with an Armani Exchange Ladies Watch! ChrisElli currently has a wide selection of watches to sunglasses, from bags to belts at great prices take alook HERE. I want to say a huge thank you to Danny for sending me this beautiful watch for review. I am very excited to announce Tara's Talons is re-opening on Sunday 21 September at 12:01 am GMT. I have a amazing discount code for you, use the code 'BACK50' for the first 24 hours to get a fabulous 50% off! TarasTalons opened in April 2013 and is the UK’s first established handmade nail polish brand! 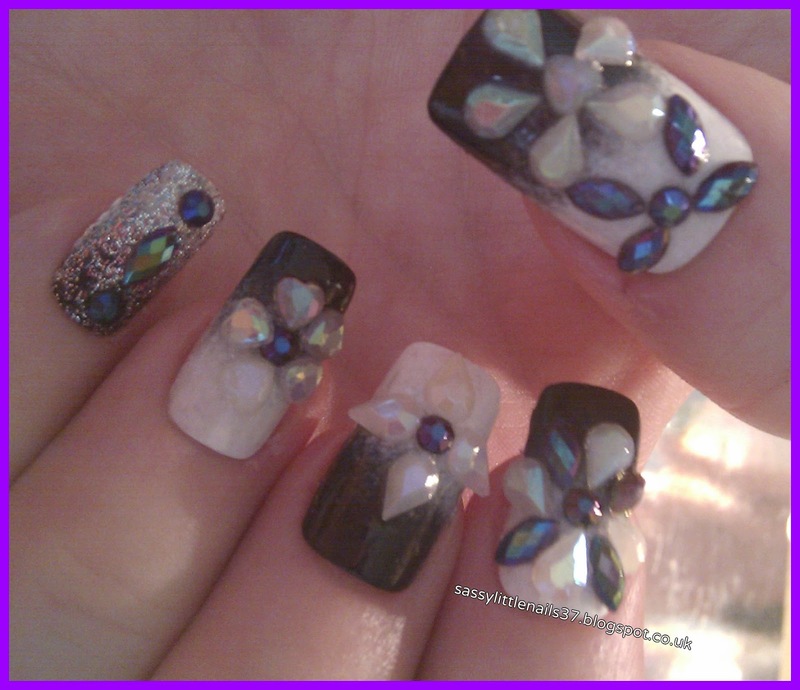 Most of TarasTalons polishes are one off, limited edition or custom. Tara has 4 new collections for you to get your hands on!. 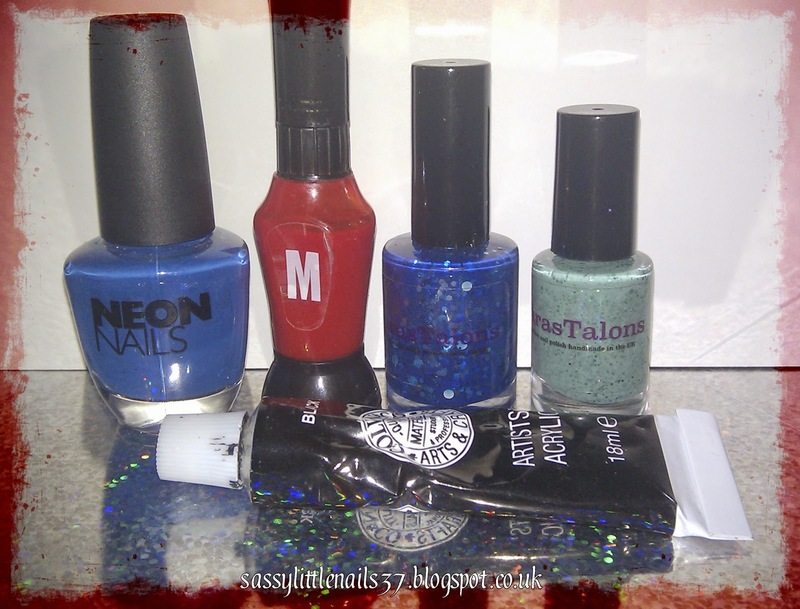 I was kindly sent 4 polishes 2 from the Return of the Randoms collection . 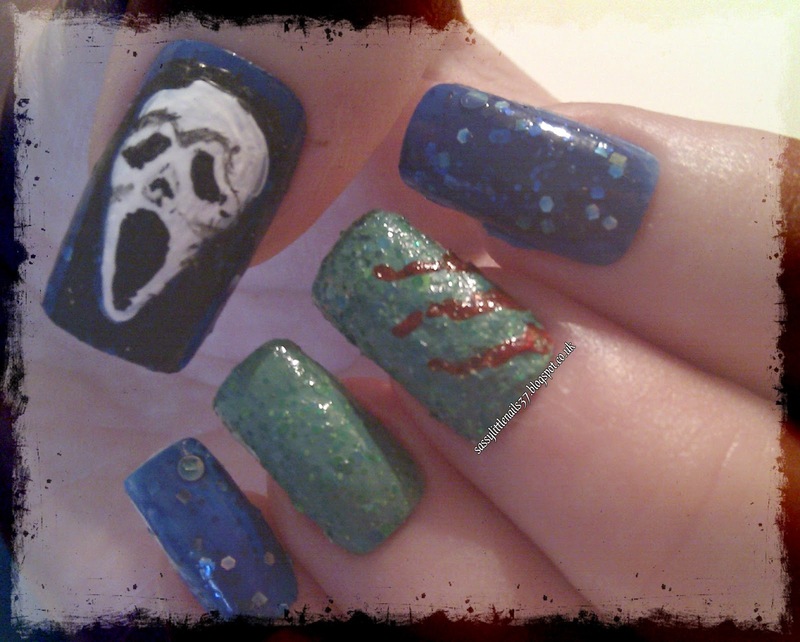 and 2 from the Halloween Scream collection is based on the Scream film 10ml/5ml . Hazy- Return of the Randoms collection. Pink sky- Return of the Randoms collection. Be right back- Halloween Scream collection. 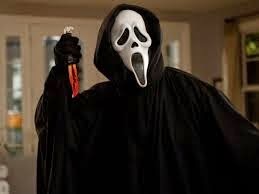 Not in my movie- Halloween Scream collection. The first mani is from the Return of the Randoms collection! 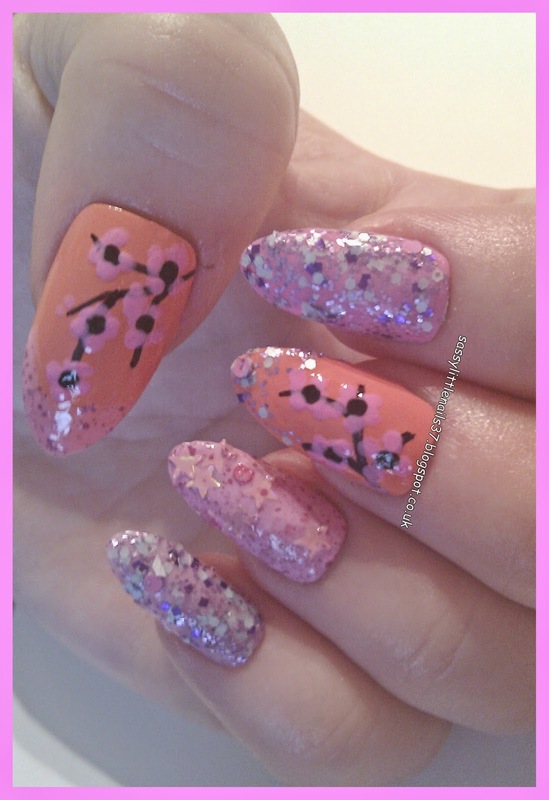 I decided to do a simple blossom tree along side the 2 pretty polishes. 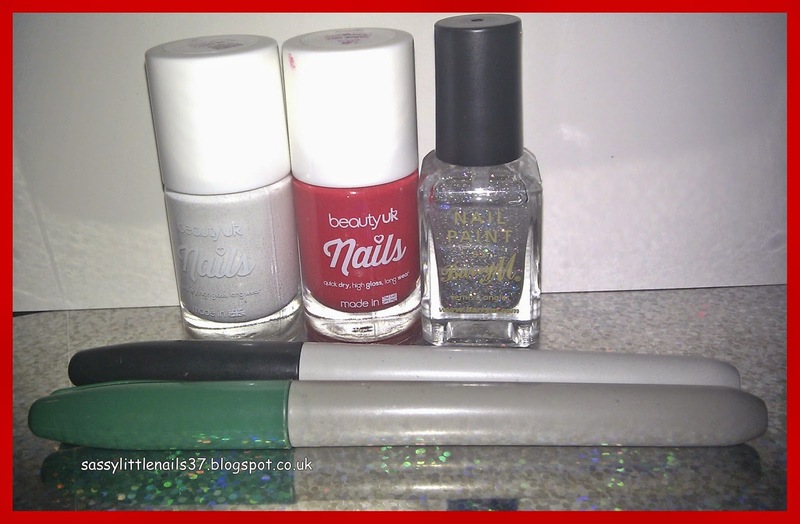 beautyuk polishes in Black out and White out. The first thing I done was start with a base coat so I used the Sugary sweet polish on the pointer finger and ring and little finger. and the Tiger lily polish on the thumb and middle finger. 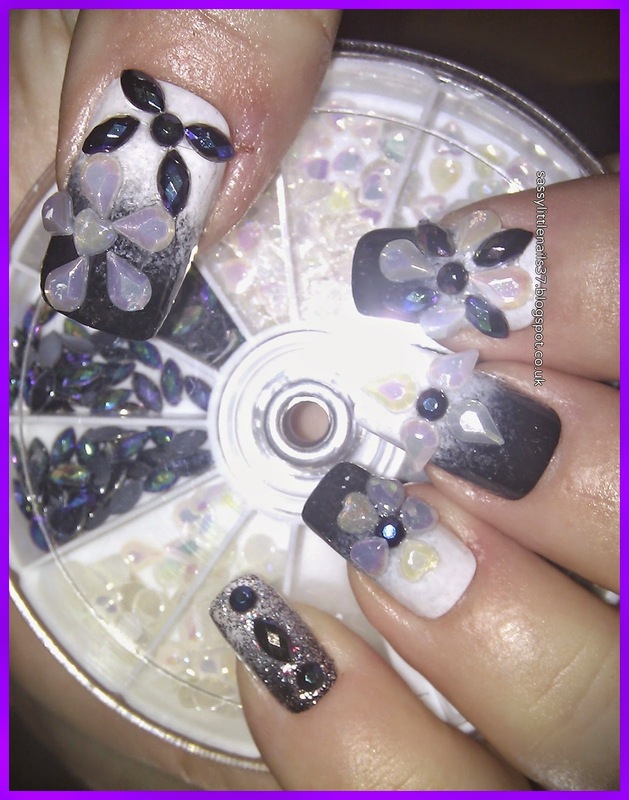 I then used the Black polish with a nailart brush and painted the branches I took the Sugary sweet and used the dotting tool make the blossom flowers over the branches then dotted some black for the centre of the flowers. I then painted over the pointer finger and little finger using Hazy a pretty matte topcoat with speckles and lovely glittery sparkles! 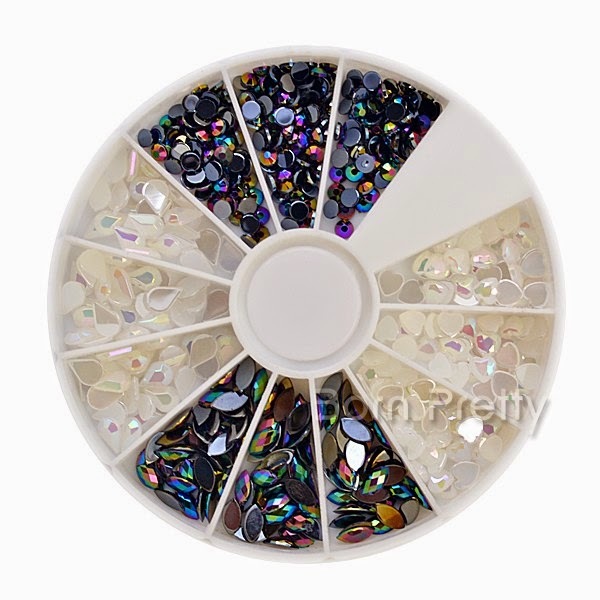 This would look great over any polishes. I chosen the pink shade and gave the pointer 2 coats the little finger I gave it 3 coats.the polish dries super fast so you have to work quick. I then dabbed a little on the nail tip on the middle finger.I love the fact it is a matte top coat with sparkles! The ring finger I used the Pink sky polish is a gorgeous pretty girly pink of starry glitter and sparkles!this has a slight matte effect and is super fast drying I gave it 2 coats also.I dabbed some also on the thumb nail tip. as you can see the polish has a pink shade to it.just gorgeous! 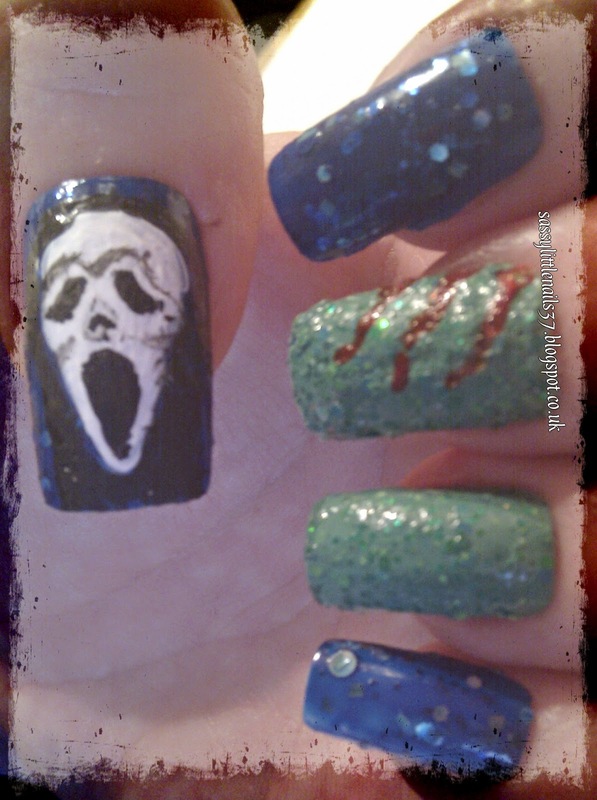 Last up is one of my favs the Scream collection nailart!! So for this collection I decided to go with the theme and do the Scream face mask from the hit movie! Here is the list of items I used. B&M neon polish in Blue. 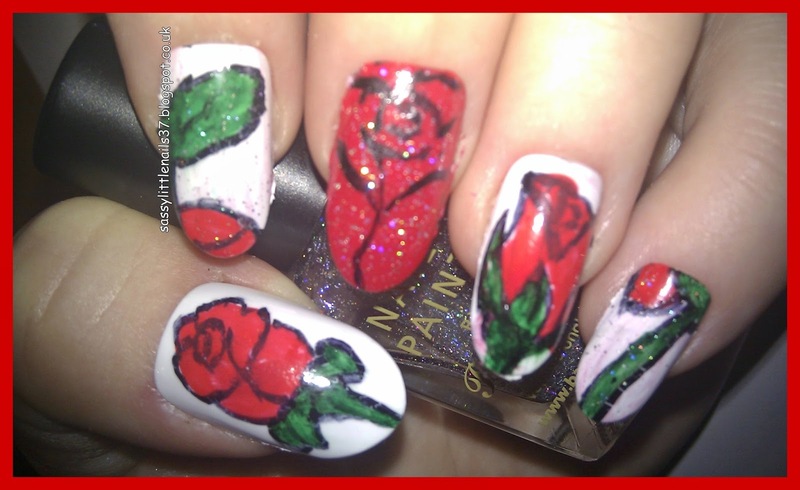 I started by using the B&M polish as a base on the thumb and pointer and little finger. 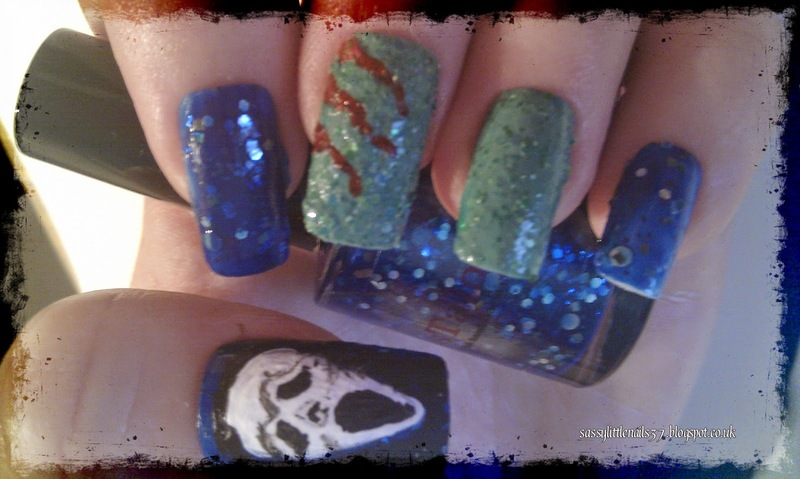 I then went over the fingers using the Not in my movie- Halloween Scream collection. it is a wonderful sheer Royal blue shade with gorgeous sparkles! I gave it 2 coats of polish and I found this polish to dry fast also which is a bonus! 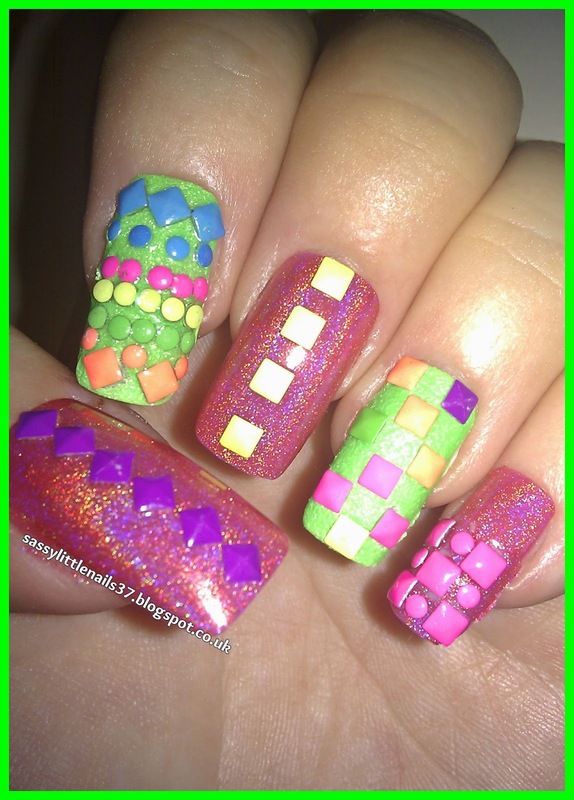 On the middle and ring finger I painted the nails using the Be right back- Halloween Scream collection.is a matte mushy pea green polish with speckles of glitter. dried fast also and I gave it 2 coats. 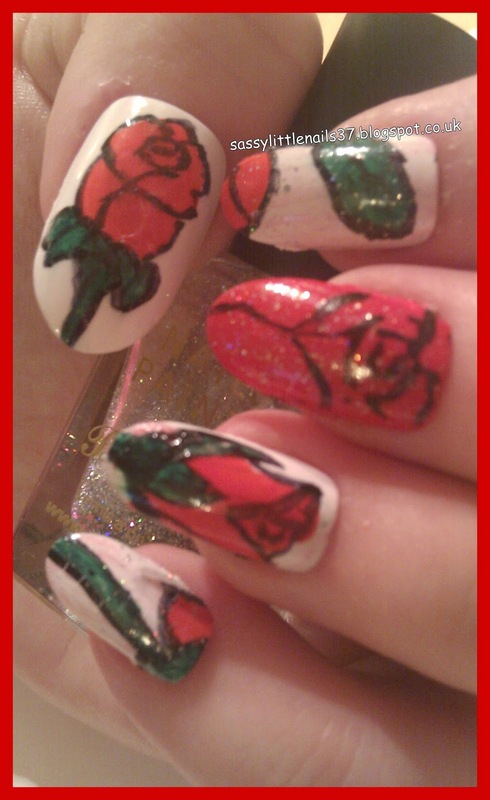 I then did a few bloody stripes across the middle finger nail using the Red nailart pen. The thumb I freehand painted the mask/face using Acrylic paints in black and white. All of Tara's polishes I have found to be of a high standard of quality that you would get from the high street but these are handmade and excellent value for money! So do not forget to use the discount code 'BACK50' for the first 24 hours to get a fabulous 50% off! You can also use my blogger code to get 15% off any order if you miss the first 24hrs. 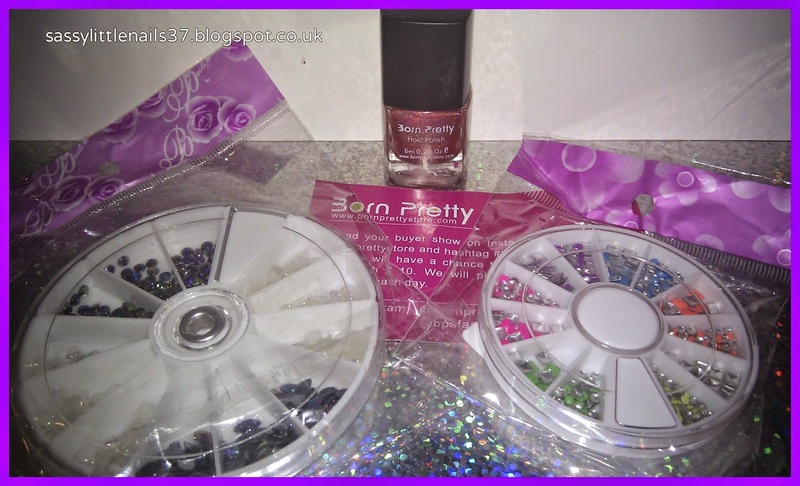 Just enter SassyLittleNails at the checkout! More posts coming up! thanks for reading have a lovely weekend! As I have been blogging now for a year! I thought it was about time that i told you a bit more about myself. I saw this blog first sugarandspicelifestyle and I thought I would join in! So here it is my 25 questions about me. Please remember to comment and follow. yes....Mary After my father's Mother. Christmas, I love the shopping,gifts,spending time with family. and the decorations. Yes. Quite some time ago. Yes 2, a brother and a sister. I do love Chinese food and sometimes Indian food. 18. Do / did you like school? I didn't really enjoy school no. Eastenders. Corination St. The Xfactor. Supernatural. Grimm. The walking dead. That is my 25 Q&As done! I tag everyone to join in who reads this post! I hope your week got off to a great start. 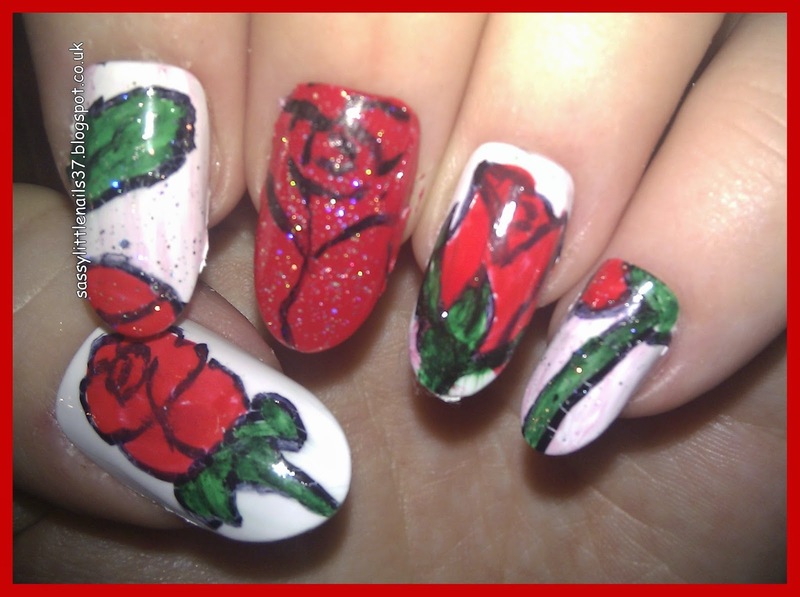 I have hurt my right shoulder so doing everyday things is a challenge at the moment as is nailart (right being my dominant hand) nailart is proving the most to be difficult. but I do have help at hand for chores etc if I need it so that's good. 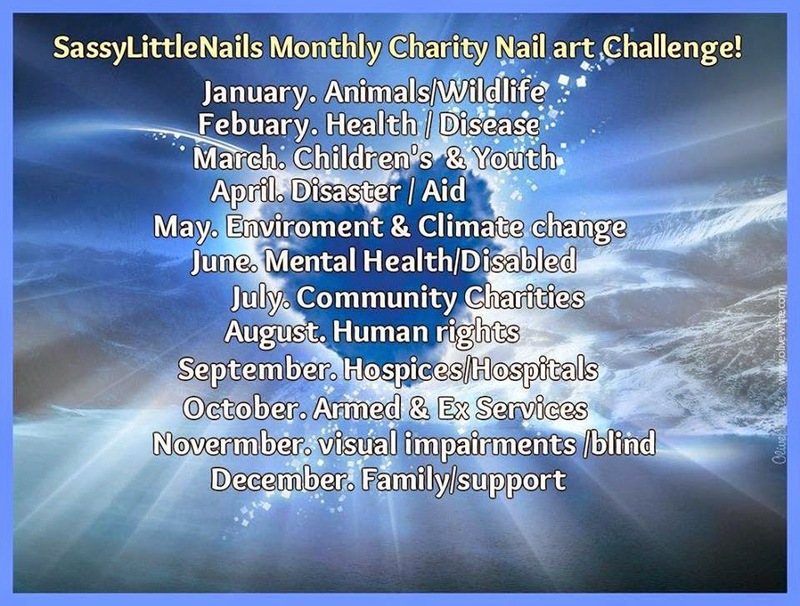 It's that time again for my SassyLittleNails Monthly Charity nail art challenge! 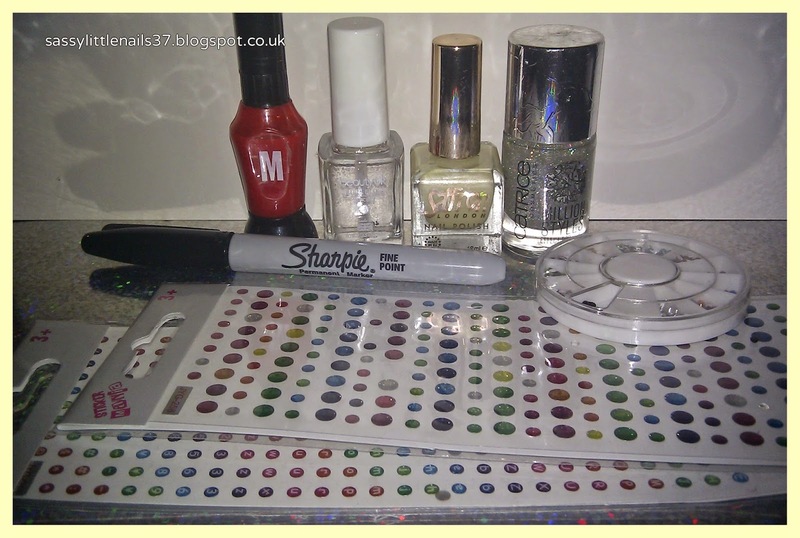 Please feel free to join in my charity nailart challenge. This month of September charity is for Hospices/Hospitals. I have chosen a special Hospice called Zoë’s Place Baby Hospice.Registered National Charity No. 1092545. The Zoë’s Place Trust is a registered charity providing respite and end of life care to babies and infants aged from birth to five years suffering from life-limiting or life-threatening conditions. 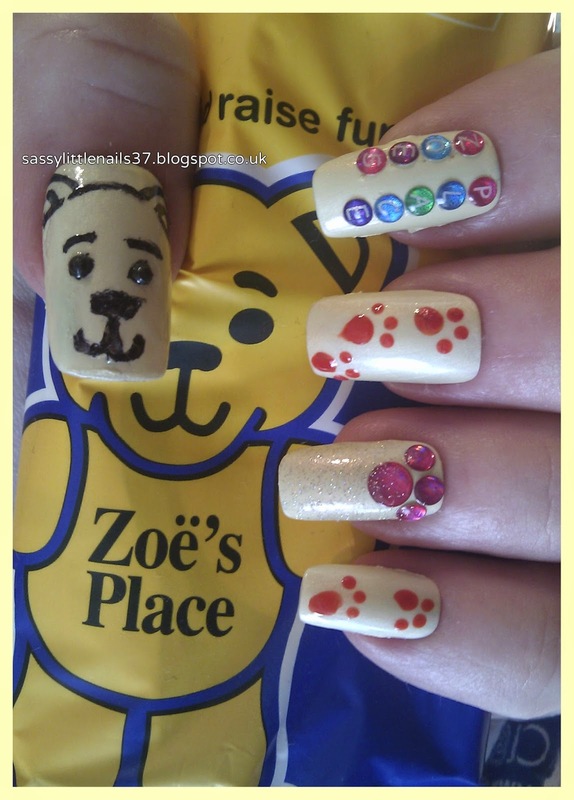 Items used to create this nailart in support of Zoë’s Place Baby Hospice are below. Beautyuk high gloss top coat. Catrice million styles polish in Have an ice day. 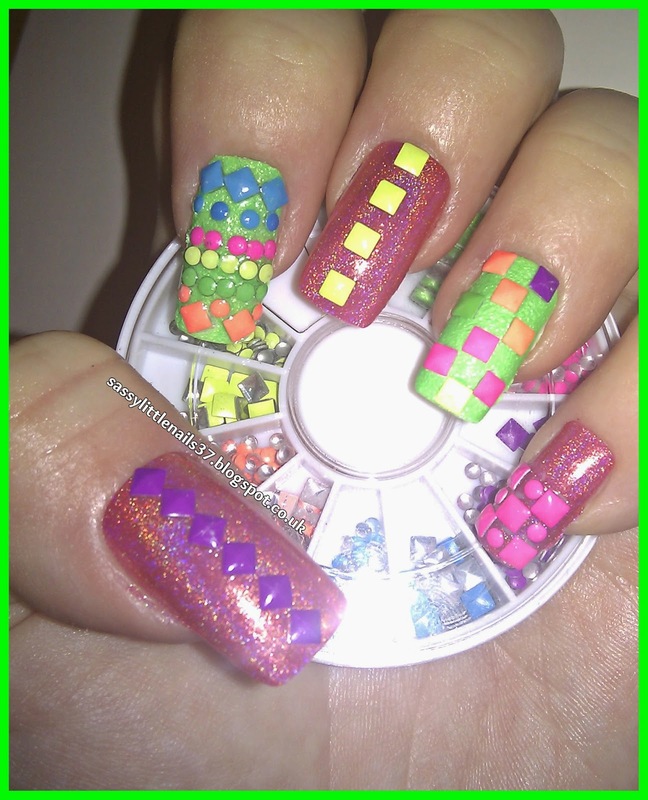 2 packs of coloured nail stickers 1 with letters. I applied 2 coats of the Saffron polish to each nail. The thumb I freehand drawn the bear's face and stuck on2 black rhinestones on his eyes. The pointer finger I stuck on the stickers with the letter's spelling Zoes place. The middle and little finger I used the nailart pen and did some freehand paw prints. 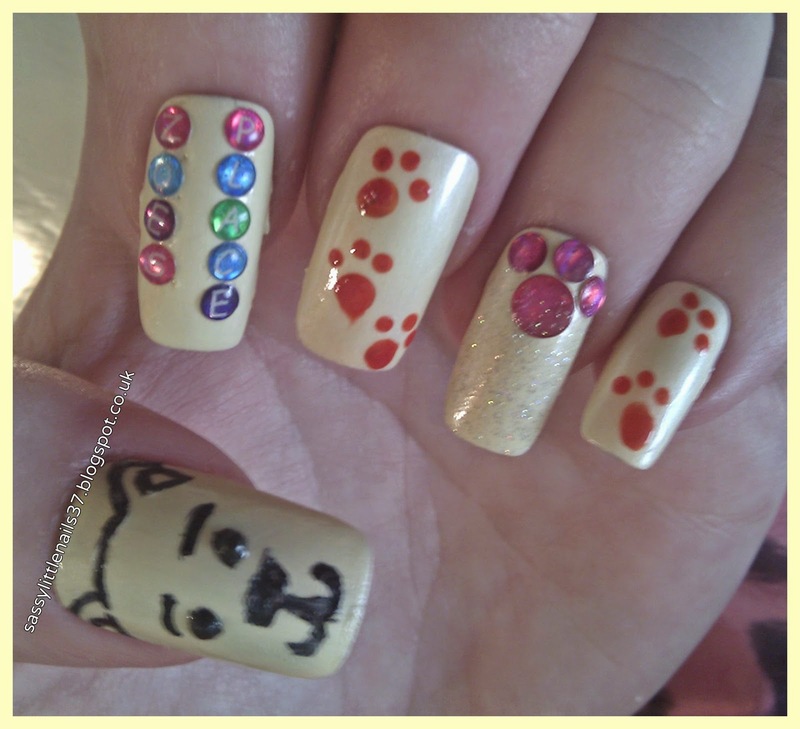 I stuck some more stickers on the ring finger to make a paw shape also.and gave it the glitter Catrice top coat. 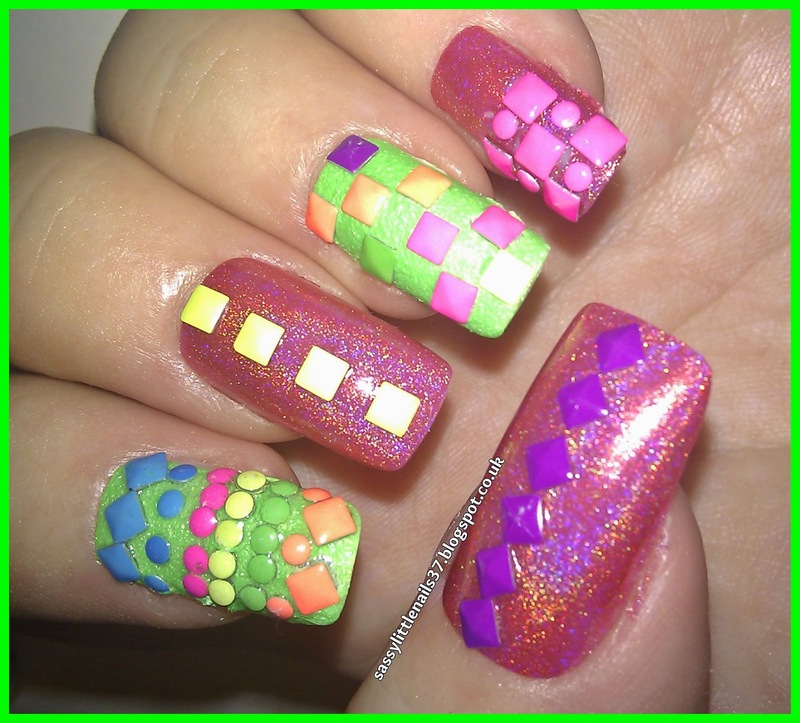 I gave the other nails a clear top coat to finish. 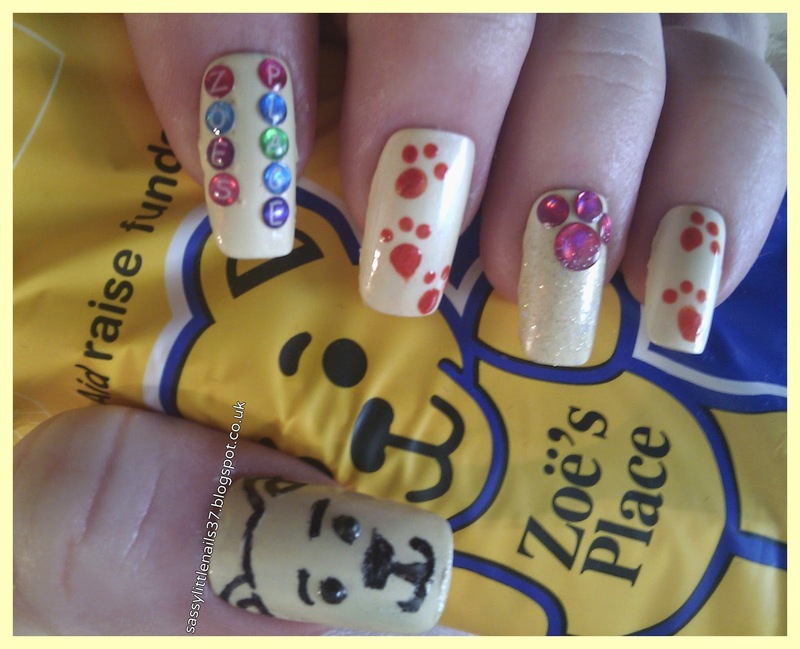 I hope you liked my Charity nail art to support this charity and raise awareness please help all you can thank you.